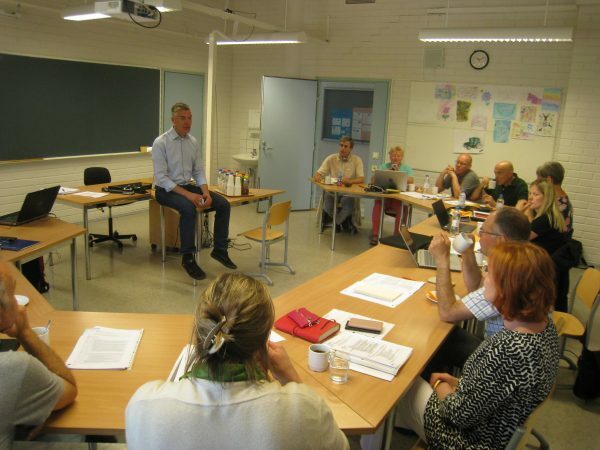 From June 12-16 the LOASA partners held their final transnational project meeting in Kokemäki, Finland. It was well hosted by SASKY College. The main outcomes of the meeting are as follows. We’ve worked on the recommendations for adjustments and optimization of the learning units and assessments, based on the pilot results. Susanna Vestling, ECVET expert in Finland, explained the way of thinking that external assessors usually follow to evaluate Erasmus+ projects. All participants ran through a series of questions that need to be answered in the final report. A very valuable session that we can recommend to any other project. We reflected on the process and the lessons learned. We also discussed the impact of our LOASA project so far. Although the application was very ambitious, we’re glad to report that we’ve created impact on most parts. All LOASA partners have built a strong common understanding of what working with the New Skills Agenda for Europe means and how to cooperate in developing those skills. Exemplary is SASKY. At this college the importance of developing social-emotional skills to increase the students’ employability, has become structurally part of both the preparation of students, and the training of assessors. Students (and employees) who engage more actively in international mobility programs, will get an increased awareness and understanding of their own capabilities and the opportunities in the labour market, leading to an increased employability. Following this notion, Jordbrugets Uddannelsescenter Århus has used LOASA to organize all processes around mobilities in an integrated, structural way. Every student who goes on an internship abroad now travels with a learning unit plus assessment form that has been prepared at school together with a coach. We made a contribution to bridging the gap between the labour market and educational partners. Exemplary is the reinforced relationship between Centro Tecnológico Nacional de la Conserva y Alimentación (CTC) and Centro Integrado de Formación y Experiencias Agrarias (CIFEA) in Murcia, Spain. Prior to LOASA, both parties hardly ever met. Since the launch of LOASA, they have met nearly every month, resulting in effective collaboration – from co-creating learning units to organizing a multiplier event. Branches have demonstrated their role as a supporter for the green sector in innovation and proved to be a strong partner to disseminate the outcomes to the whole sector, e.g. ProAgria, an association of agriculture and horticulture, has actively participated with YA vocational college of Ostrobothnia to organize a multiplier event in Finland. The same goes for Van Senten’s co-owner and managing director, who is also a board member of Dutch branch association VHG and thus brings a substantial dissemination opportunity to the table. For VET institutes the learning units are a starting point to further develop and implement the learning outcome-based approach in their education in accordance with the needs of the labour market. Exemplary is Wellantcollege, where thanks to LOASA, the full training course Equine Sports and Management will consist of outcome-based learning units based on ECVET Principles and the New Skills Agenda. Of course, there are also some challenges left. One of them is how to make the companies more involved, more connected to the educational partners in the project. The meeting also included an interesting excursion to the Frantsila company, an organic herb growing farm, processing factory, demonstration garden and shop, and educational facilities that also act as a wellness centre. Last but not least, we collectively want to make this project’s outcomes sustainable. That’s why we’ve planned the next meeting on February 4-5, 2019 in the Netherlands to discuss LOASA’s longer-term impact and possible follow-up projects.